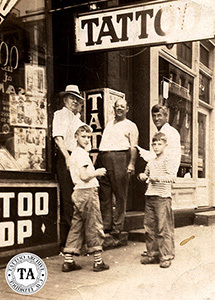 Cleveland is not one of the most common family names in the United States, but there have been at least five Cleveland's in the tattoo business: Charles, Walter, Art, Trader Bob and Barefoot Bob. It is known that Art and Bob were brothers, but it is unknown if Walter was related. The Mike Skiver Collection contains some Charles Cleveland flash but the Tattoo Archive knows nothing else about him. Barefoot Bob is the only living Cleveland and his interest in finding out more information on the other Cleveland's spurred us to do this research. I believe that Walter was the oldest of the Cleveland's so we’ll start with him. Walter Cleveland (1887-1968) was a New Hampshire native. 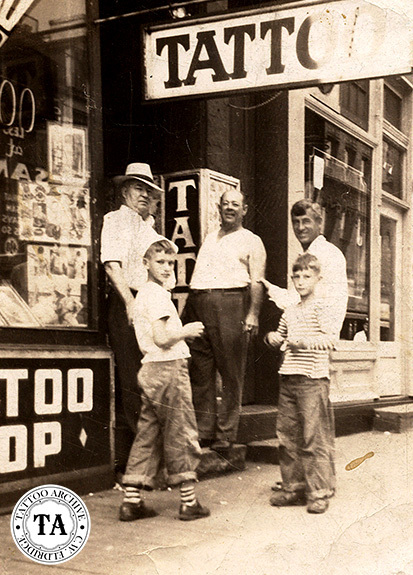 A 1943 news article in the Portsmouth Herald stated that he started tattooing by hand and took up the profession in 1909 in New York, and by 1916 he was using the electric machine. Today Walter Cleveland is probably best known for his years of tattooing in Columbus, Ohio, Georgia and Norfolk, Virginia. 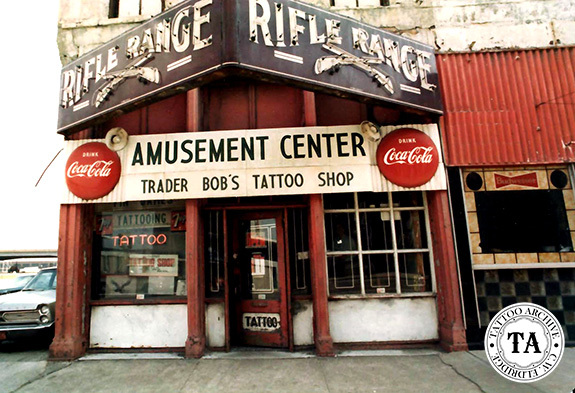 In Columbus he tattooed in at least three different locations on Broadway, #934-#936 and #940. In Norfolk it is thought that he worked with Jack Wills on East Main Street. Walter Cleveland was not thought of as a supplier but he built machines and one of his machines is worthy of some note. The frame was a single upright design but the back spring mount was cut and a fulcrum type armature bar was used. The way the armature bar was designed, a rubber band was used to replace the back spring. This was not a specially cast frame featuring this set-up; a standard twin coil frame was modified for the pivoting "A" Bar. Other versions of this frame design have been built, sometimes using a spring instead of a rubber band. Cleveland’s machines are often seen in an olive drab green finish that makes them look like a military issue item. 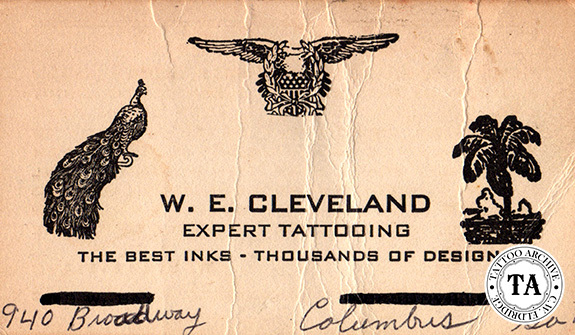 In Alan Govenor’s book Stoney Know How, Life as a Sideshow Tattoo Artist, Stoney St. Clair remembered Walter Cleveland as a friend. Walter liked to say he was the only left-handed tattooist in the country although he had lost part of that hand. Stoney had one story about that loss saying that Cleveland got part of his hand blown off in World War I and had to wear a clamp on his hand for tattooing. The more often repeated one is that the loss was the result of a sawmill accident. 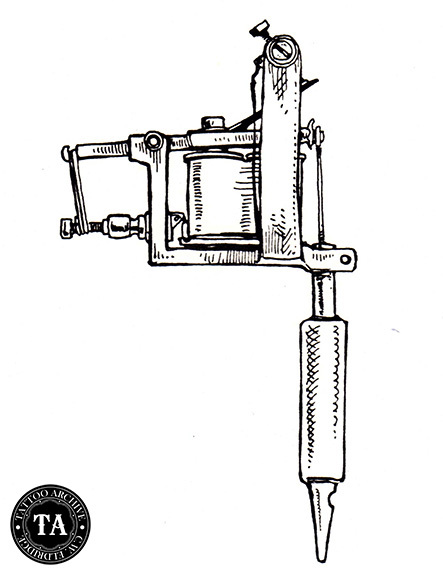 Stoney went on say that Walter Cleveland invented several tattoo machine styles and that you couldn’t go visit without him giving you a machine. In a 1974 news article in the St. Louis Globe, Don Hammonds wrote that Bob Cleveland was a bearded gentleman who looked as if he just stepped out of a Herman Melville novel. Hammonds went on to say that Cleveland learned the art of tattooing from a man known as Tahiti Felix in San Diego. This interview was done at #716 North Broadway shop, St. Louis, Missouri. In a 1982 letter Mitch Mitchell wrote that he thought that Trader Bob Cleveland bought the #716 location either from Sailor Larry or Art and Fay Balch, he wasn’t sure. But he thought it was in the mid to late 1950s after Bert Grimm left that address for the Nu Pike in Long Beach, California. The McKinney's bought the #716 location in early 1968 and Trader Bob Cleveland continued to worked for them until 1973 or 1974. Mitch started tattooing there in 1975 and when they tore down the building in 1978 to build a parking lot, Mitch got the entire contents of the shop. According to Bruce Cleveland, one of Bob sons, Bob Cleveland died July 22, 1993. Bruce Cleveland went on to say that his uncle Art gave up tattooing and was embarrassed by his tattoos keeping them covered later in his life. He died in Maryland on June 16, 1999. Several sheets of Art and Bob Cleveland’s flash have survived in collections today. A big shout out to Carmen Nysen for her help with this update.